In this region, there are a few winemakers using the old traditional elaboration of RED WINE and ROSE WINE as it was made in the old days when chemistry still was in its infancy. Although the old Romans used chemicals like Sulphur dioxide, SO2 (Sulfate). A preservative preventing the wine from turning into vinegar. My mentor and our former wine maker's father went to South of France every season to harvest and help out in Natural Winemaking. He brought the experience back to Spain and made it mostly from Tempranillo, the famous Spanish red grape variety with a lot of natural preservatives, Tannin. The other necessity for a prolonged shelf time is the alcohol level, It is recommended over 13.5% by volume. The Maceration is the process when the grape skins are left in the VAT. The length of time determines the level of tannin's in the wine. Also how much we are circulating the must and grape skins for an equal fermentation. The fermentation starts naturally from the natural yeast on the grape skins. After fermentation or sometimes before completed, we are Racking over the wine to another VAT and leaving the grape skins to be pressed. The wine pressed out will have too much tannin to be Racked back to the same VAT. Instead, it will be stored in barrels and may be reused to help other grape varieties with taste and preservatives. Most commercials made wines have been elaborated in big scale and chemicals have been used to help in the process. That can be from issues with the grape vines like different kinds of mold like mildew, pest, insects, and unpredictable picking weather. By using chemical preservatives like Sulfate they need less tannin and can make the wine faster to less cost and less price in the supermarket. 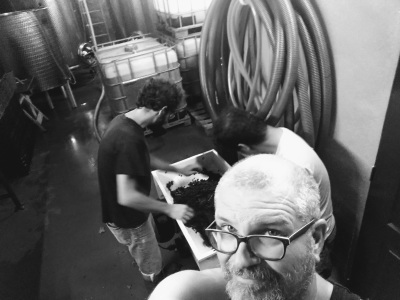 The winemaker with two helpers crushing red grapes and then pumped into a 3.300 Liter VAT. Lab tests in naturally made wine show very small traces of Sulfate as it is a natural chemical found in wine. Most wineries not making a Natural Wine would add Sulfate in the Grape Juice before fermentation as well as after in order to minimize the risk for a failed fermentation. We have to accept failures sometimes. Therefore more costly to produce. In our ecological vineyards, we have full control as the number of grapes is in a controllable scale to harvest when it is most favorable. Subsequently, we are able to make a Natural Red Wine with no added Chemicals. But as mentioned before some traces of Sulfate will always be found as it is a natural chemical in wine. White Wine and light Rose Wines always need Sulfate as a preservative. They have also a lot less natural Tannin which means that it is a Wine to be enjoyed by people who have a problem with headaches from Tannins.